Most Indian children would have played the Snake and Ladder game. This game incorporates the basic truth about life that there will be ups and downs in life. 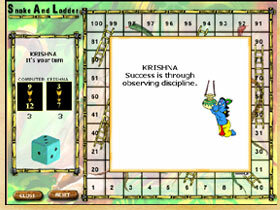 When you climb-up the ladder in this game it denotes a joy and a climb-down denotes a sorrow in life. You should still reach your goal and make efforts in this direction. If you do, you are the ultimate winner.